I was asked about fitting a Stradale TCU to a regular 360 the other day so thought I would write some notes on the F1 system and incorporate some info on the TCU. The transaxle on the 360 is near identical between the manual and F1 models (the shift mechanism is different and there are some extra sensors on the F1 ‘box). The clutch system is also near identical (just the throw out bearing is different). This means that the F1 system is doing the same thing as the driver would do in a manual 360, albeit much more quickly. There are two basic elements to changing gear, clutch control and gear selection, and it is these operations we will look at the F1 system in detail. Gear selection in a manual car is defined by two input parameters – the left/right and up/down position of the gear lever. Different combinations select different gears. These inputs are transmitted in linear backwards/forwards movements to the gearbox via cables – these cables operate the gear selection forks. 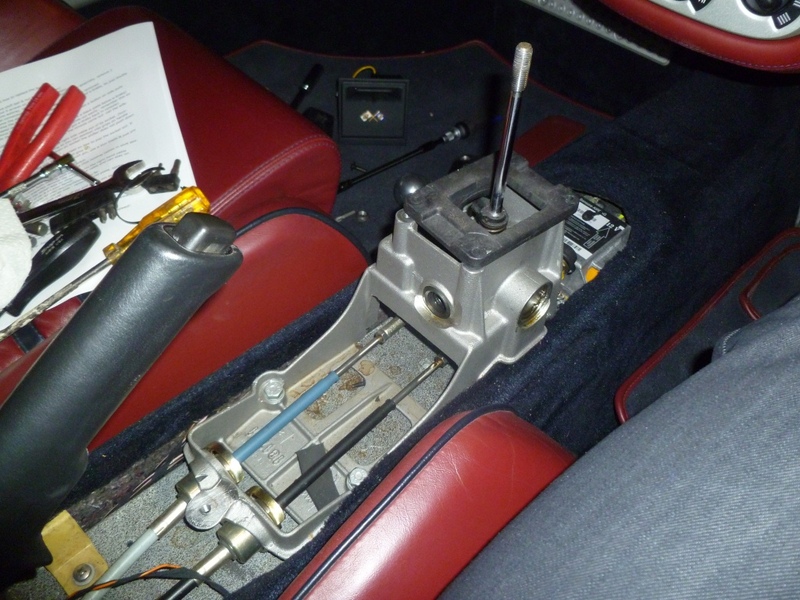 These two pictures show the cables at the gear lever and gearbox ends. 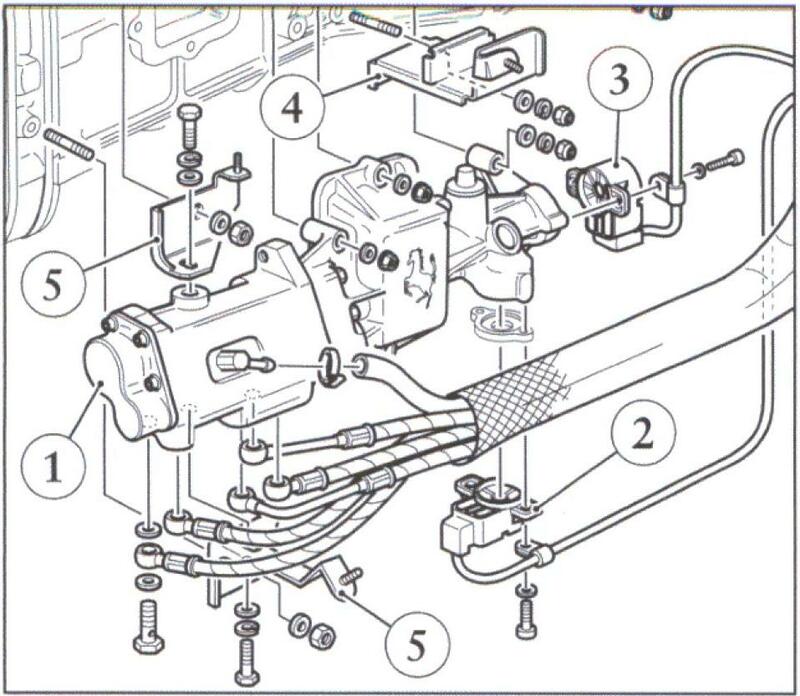 The F1 system dispenses with the gear lever and cables and instead utilises two hydraulic actuators that attach directly to the gearbox (number 8 in the diagram above). 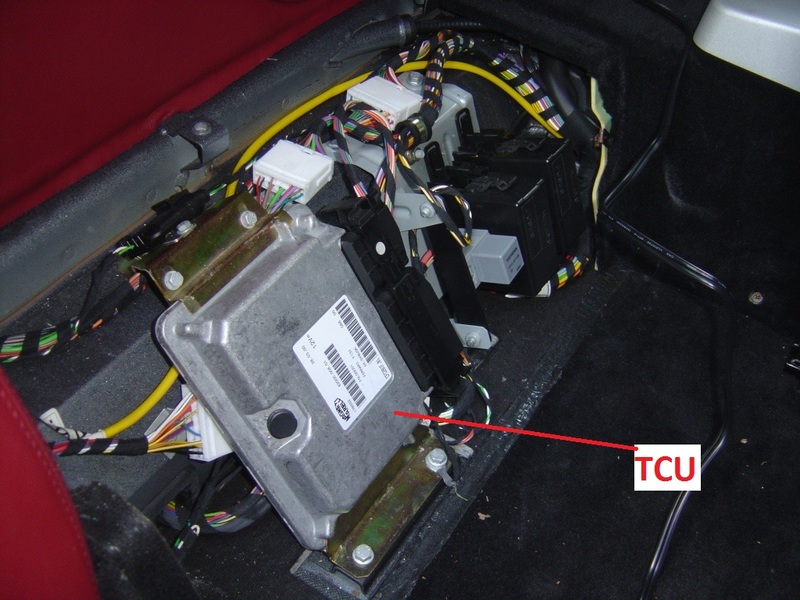 These actuators replicate the the left/right and up/down movement of the gear lever. 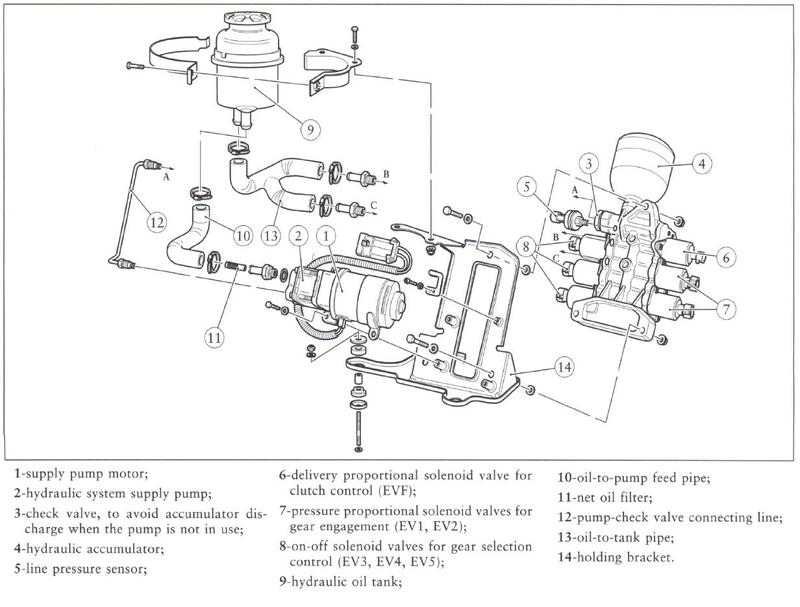 Here’s a diagram showing the actuator unit (1) and associated fittings. The hydraulic system is driven by a power unit (housed inside the rear right hand wing). The power unit is driven by a hydraulic pump – you can hear the pump operate when the drivers door is opened for the first time from cold (as system needs priming ready for driving). Whilst driving, the pump keeps the hydraulic system up to pressure by cutting in and out periodically. There is a relay that controls the pump that is prone to failure – read more about that here. The power unit also comprises valves to operate the actuators, a fluid reservoir and pressure accumulator. The pump is known to fail, commonly by the control relay sticking closed. The pump is shared across several Ferrari, Maserati and Fiat models and can be bought relatively cheaply if you shop around. It’s not actually the pump body that fails but the electric motor that drives the pump. The motor is a straightforward unit and can be re-wound for little expense. 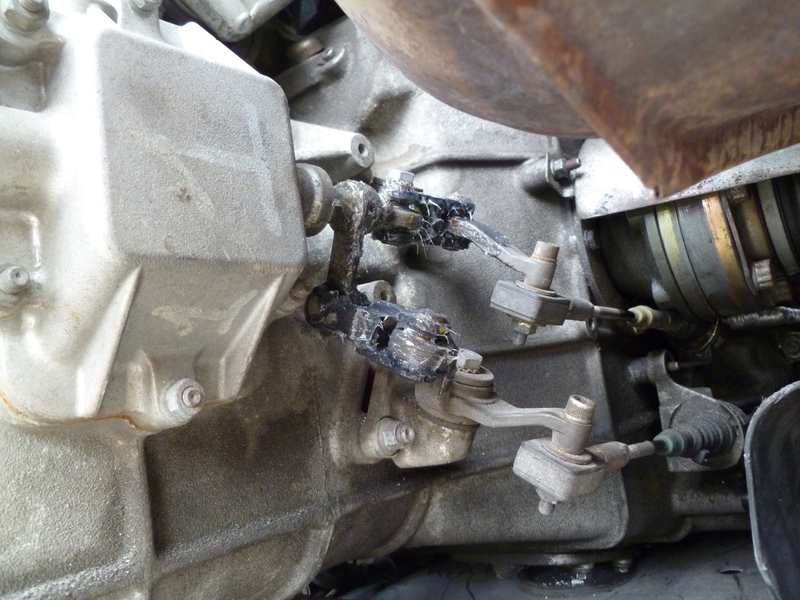 I have even seen pictures of a wiper motor grafted onto the pump body but wouldn’t recommend this course of action! Clutch control in a manual 360 is simply a hydraulic master cylinder (driven by the clutch pedal) and a slave cylinder (housed inside the gearbox). The F1 system dispenses with the clutch pedal and master cylinder, instead the slave cylinder is driven by another actuator on the power unit (number 6 above). However, just operating the clutch isn’t the whole story. In a manual car the driver has to modulate the throttle at the same time the clutch is operated and the F1 system also does this, but to a far superior degree. During the gear change the torque delivery of the engine is controlled by the Motronics in three stages. 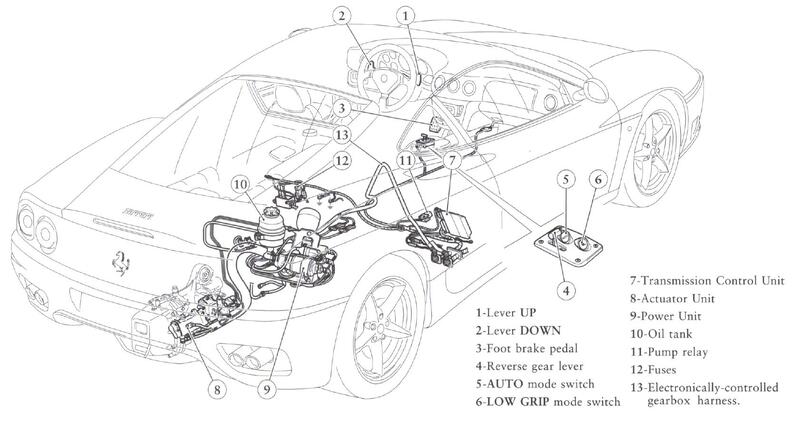 As the clutch is disengaged the torque delivery of the engine is reduced. Once the clutch is fully open the Motronics hold the engine at a steady speed. As the clutch is closed the torque delivery of the engine is increased to match the requirements of the new gear. What this means is that gear changes can be performed with the throttle buried in the carpet with no danger of over revving the engine. Not having to lift during gear changes means that performance is increased over a manual car. At its fastest, the F1 system will change up a gear in 150 milliseconds. Furthermore, when Sport Driving Mode is activated the F1 system double declutches during a downshift (which can be heard when the engine revs are blipped). This means that the lower gear can be instantly selected which means if there is no input on the throttle pedal (ie: under braking) then additional braking at the rear wheels in provided. Double declutching also provides for a faster downshift. Based on each of these inputs, the TCU has a number of maps to refer to which in turn determines the speed of the gear change. The driver can influence the speed of the gear change with the sport switch, throttle position and engine speed. Sport driving mode speeds up the gear change, a higher throttle position also speeds it up as does changing up a gear at a high engine speed. The TCU holds more than just read-only maps, it also stores data such as distance travelled in each gear (useful for verifying the odometer), clutch wear (a calculated number based on a complex algorithm) and clutch overheat time (accompanied by the overheat buzzer). The higher the part number, the “better” the TCU. Better in this context means faster shifts with lower clutch wear. There were some critical updates during the production run, the first being part number 189542. TCU’s prior to the introduction of this part did not have the capacity to manually set the PIS (more detail below). This switch over occurred on VIN 124874 (in 2001). The maps were then progressively improved but there was a marked difference with part number 197533 (first fitted to assembly number 47115 in 2002). This TCU (as well as the updated 211023 introduced at AN 47380) had much faster and sharper shifts as Ferrari took lessons from the mapping of the Challenge Stradale TCU. The good news is that the maps from 211023 can be flashed onto the microprocessors fitted to all the previous TCU versions from 189542 and above. EDIT (Jun 2014): According to respected Ferrari expert Brian Crall, the differences in TCU are a little more subtle than I noted above. The later TCUs were programmed for smoother more seamless shifting with the one introduced mid 2001 or so having the quickest, most positive shifting. PIS stands for Punto di Incipiente Slittamento or, in English, Point of Initial Slip and is a parameter that (in simple terms) tells the TCU where the bite point of the clutch starts. It is measured in mm and would typically be in the region of 4mm to 5mm. The PIS is entered into the TCU when a new clutch is fitted and an algorithm works out how it changes as the clutch wears out. To properly calibrate the PIS you need an SD2 machine (or equivalent). Having a too high PIS means that the TCU expects the clutch to bite when it doesn’t. This erroneous message causes the TCU to hunt for the biting point and thus “slips” the clutch which in turn causes premature wear. Badly worn clutches can be made to last longer by resetting the PIS. With the earlier models of TCU there was no provision for setting the PIS. Instead there was an operation called “PIS Autoset” which is a crude automatic method of setting the bite point. Despite not being able to set the PIS directly, a skilled operator with an SD2 machine can influence the PIS so the clutch action is improved. Clutch wear is worked out by an algorithm in the TCU based on a number of parameters. It is not the be all and end all of measures and I have seen cars being driven with wear reported above 90%. Early signs of clutch wear usually manifest themselves as dropping into neutral and missing gear changes. Flywheel condition is also an important part of how long a clutch lasts. A badly damaged flywheel is usually dished – if a new clutch is fitted to such a flywheel then it will wear out very quickly as the contact area between the two components is much reduced. All other things being equal, clutch wear is a function of shift time since the longer the TCU takes to move the clutch from open to closed, the more slip occurs. By reducing the time the TCU changes gear, the clutch life can be prolonged… The higher the TCU part number the faster the shifting. Sport driving mode also quickens the shift. Shifting at higher engine speeds and with a high throttle position speeds things up. Being very positive with the throttle when pulling away from a standstill also reduces the time the clutch is slipping. However, the best strategy for increasing shift speed and reducing clutch wear is to fit the TCU from the Challenge Stradale (part number 196986). It is not quite plug and play, as there is about 30 mins of work required with the SD2 machine in order to transfer over information from the old TCU and reset the PIS. The CS TCU transforms the way an F1 car drives and, in my opinion, is how the cars should have been shipped from the factory. The part isn’t cheap (about £1,200) but it is worth every penny. The CS TCU will fit any 360 F1 car, regardless of what TCU part was originally fitted. The CS TCU also contains “Race Mode” mapping within the TCU which allows for even faster and more aggressive gear changes. Race mode also performs the double declutching operation on up shifts in order to speed up the gear change. Despite not having a Race Mode button, regular 360 cars fitted with an F1 TCU will benefit from the Race Mode maps when Sport Driving Mode is selected. Sadly, the CS TCU maps cannot be flashed onto any of the other 360 TCU microprocessors. However, the chip architecture of the TCU fitted to the F430 is the same as the CS so if you are able to obtain an F430 TCU then the CS maps can be flashed onto it. I know people who have done this and the re-flashed parts have been working in their cars without any issues whatsoever. Just a final note on the alternatives. There is a module on the market that promises to “provide a dramatic improvement” and “noticeably faster clutch engagement” with “improved clutch wear for all F1 models”. The cost (USD 2,000) is commensurate with the CS TCU but, in my opinion, it is a far inferior product. The module works by spoofing the signal on the CAN line containing the throttle position and fools the TCU into thinking that the driver is pressing harder on the throttle than is the case. This in turn causes the TCU to demand a faster shift speed. The module also promises a “improvement in throttle response” – no wonder as the Motronics also receive the spoofed throttle signal. A similar effect can be obtained by pressing harder on the throttle yourself….